Preheat oven to 350°. Beat eggs; add sugar. Mix cocoa and food coloring. Add 2 sticks butter and egg mixture; mix well. Sift together flour and salt. Add to creamed mixture alternately with buttermilk. Blend in vanilla. In a small bowl, combine soda and vinegar and add to mixture. Pour into three 8-inch round greased and floured pans. Bake for 20 to 25 minutes, or until tests done. Blend cream cheese and 1 stick softened butter. Add marshmallows and sugar and blend. Fold in coconut and nuts. 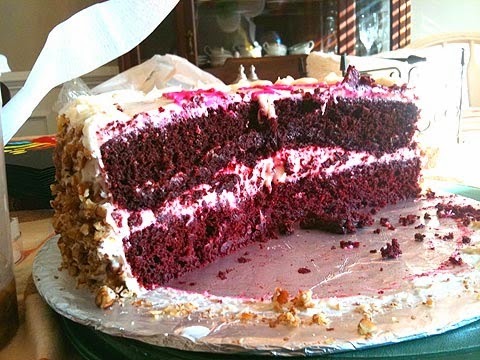 Spread between layers and on top and sides of cooled cake.